Disclaimer: While I’ll do what I can do avoid major spoilers in this newest episode, I will be assuming that readers have at least played through the first season of the game. Continue at your own peril. I’m pretty much a newcomer to the Walking Dead universe. I’ve never read the comics, nor have I seen the TV show. I’m actually not a big fan of zombie stories in general, but I am a big fan of Telltale Games. However, my chief experiences with the developer up to this point had been comedic and adventurous titles like Sam and Max, Back to the Future and the Poker Night games – lighthearted games that offer laughs and fun while you’re playing, and don’t call for very deep retrospection once they’re over. Needless to say, I was… unprepared for the violence, heartache and sheer brutality of the first season of The Walking Dead. As horrible as the subject matter was, however, I also found that I could not stay away. The story was incredibly engaging, and I grew to care about everyone in my motley crew of survivors, even if some of them could be pretty insufferable. Of course, there was one bright light who reminded you that there was still some good in humanity, one ray of hope for whom you’d do anything. The person I’m talking about, obviously, is Kenny and his boat. Ha! … OK, yes, it’s Clementine. A face only everyone could love. 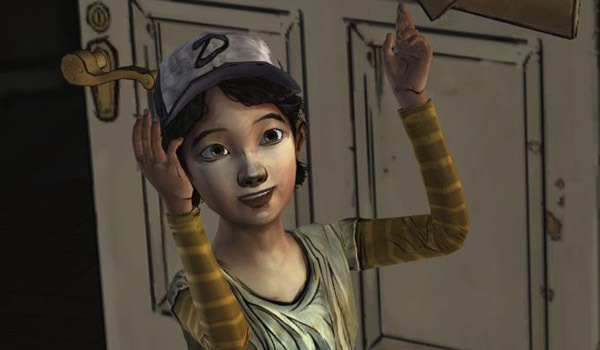 Clementine easily joins the short list of child characters whose well-being, in my eyes, becomes just as important as the overarching plot; kids like Nanako from Persona 4 and Sunny from Metal Gear Solid 4. 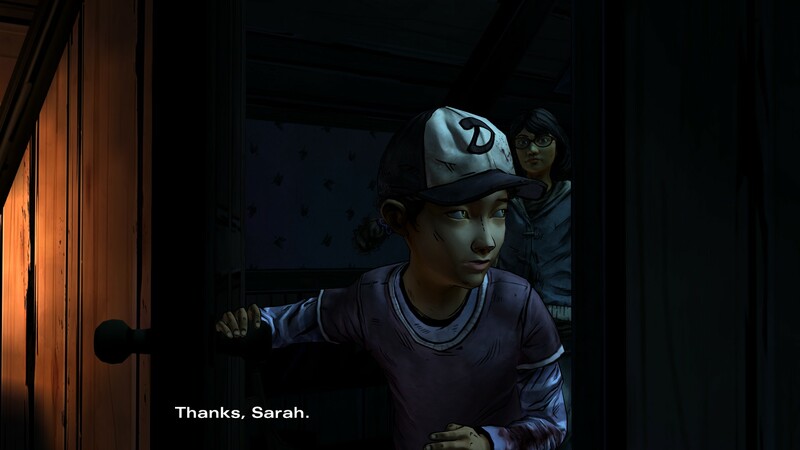 It didn’t take long for me to realize that every time I was given control of Lee during Season 1, the first thing I needed to do was find out where Clementine was, and make sure she was OK. As things progressively spiraled out of control during the course of the season, I resolved, if nothing else, to do all I could to at least keep Clementine safe, while messing her up as little as possible. I guess I even failed in that respect, as what better way is there to horribly scar a child than to have her shoot her surrogate father before he becomes a zombie, forcing her to strike out on her own? 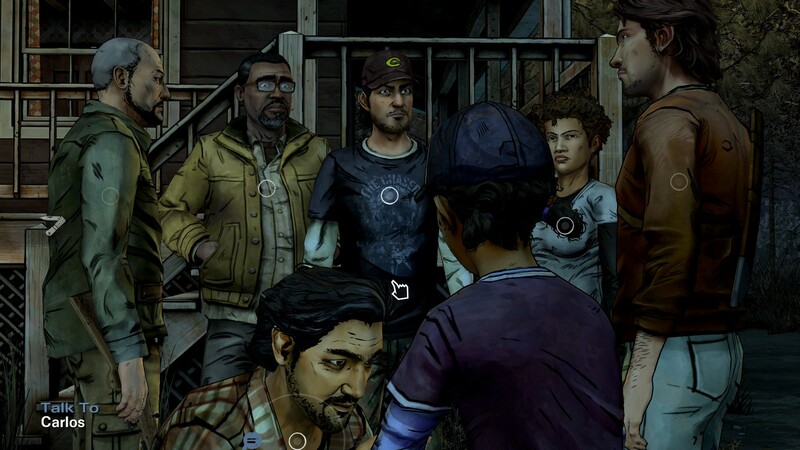 Telltale Games had a genius idea for the second season, though. 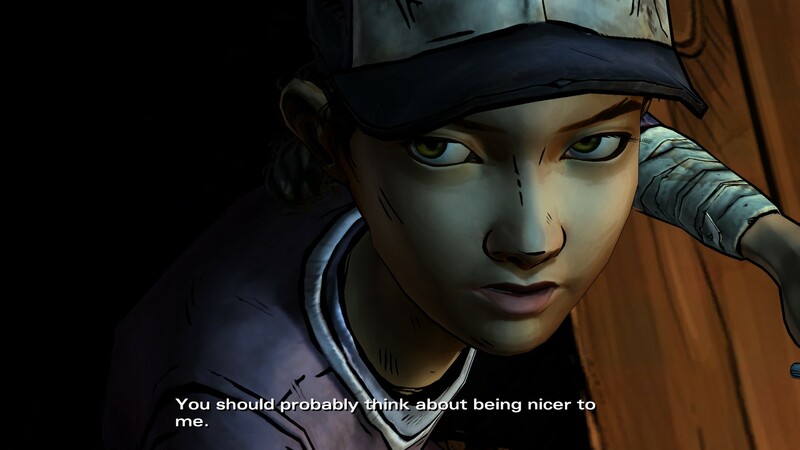 How better to make sure that Clem is safe than to take direct control of her? Well… what idea is perfect? 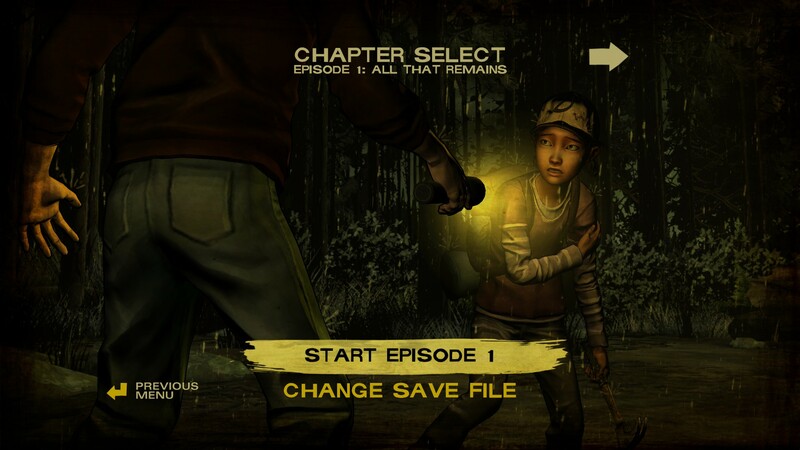 Season 2 opens with Clementine traveling with her two remaining companions, Christa and Omid. It’s obvious that a significant amount of time has gone by, as Christa has progressed pretty far in her pregnancy. Omid is his usual upbeat self, and it’s nice to talk with them a bit, but, as we all know, Rule #1 of The Walking Dead is to not get too attached to anyone. After the game’s tense and emotional intro scene, another time skip occurs. Now 11 years old, Clementine may not be quite as cute as she used to be, but I found myself no less concerned about her circumstances. 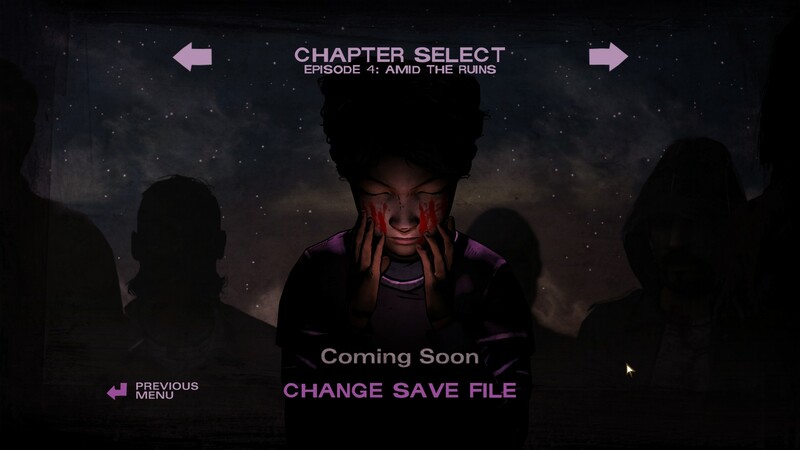 Clem soon finds herself on her own, and is quickly forced to look for food and shelter before she succumbs to the elements. After a heartbreaking encounter with a dog, Clementine is taken in by a group of survivors who are just as wary of strangers as you might expect, even if they are pre-teen girl. Come on, guys. Be cool. Pete, the leader of the group, might initially seem like a scary guy, but he turns out to be pretty friendly. Luke is apprehensive about taking Clem in at first, though with good reason. Pete’s nephew, Nick, is immediately distrustful of Clem, which will likely cause friction later on. Alvin seems nice, but his pregnant wife, Rebecca, is extremely hostile to Clementine. She’s also harboring a secret that could threaten to tear the group apart if it were to get out. One character who I feel will probably be quite significant over the course of the season is Sarah. 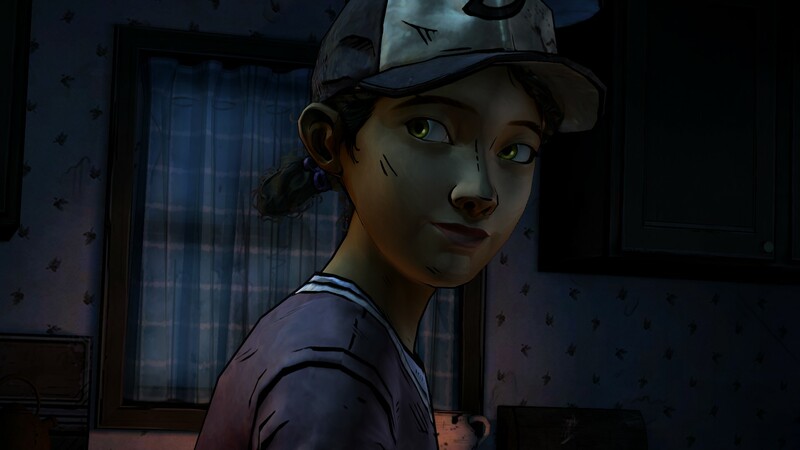 Though she is a few years older than Clementine, Sarah seems to have been largely sheltered from the true nature of the group’s situation by her father, Carlos – if such a thing is even possible some two years after Z-Day. I feel like this could end up being a theme during the season – choosing to continue to shield Sarah from the harshness of the post-apocalyptic world, or waking her up to its realities. Overall, it seems like a good group, but I don’t expect it to stay good for long. Again, I refer you to Rule #1. You helped me in my moment of need. I will remember this. The Walking Dead’s core mechanics have changed little between seasons. Gameplay is still separated into three main categories: exploration, conversation and quick-time events. Exploration is the most familiar mechanic of the adventure genre – investigating different areas to find objects and other clues to move the story along. It’s pretty standard fare – most of what you find can be viewed, picked up and/or interacted with in some way to find out bit more about the current situation. You might get tripped up a little bit from time to time, but there’s nothing exceptionally difficult about the game’s puzzles. You should easily be able to advance just by examining everything a given area. Classic adventure game fans may be turned off by how easy it is, but the puzzle mechanics definitely take a backseat to the story. The conversation mechanic that started in Season 1 makes its return, and will likely have the biggest impact on the story this time around, as well. When speaking with characters, you are given two to four options throughout each conversation on how to respond. Depending on what you say, characters may react positively or negatively, and the things you say could come back to bite you later on in ways that are not immediately apparent. Clementine may have been a sweet little kid in the Season 1, but, if it strikes your fancy, you are able to make characters see her as more threatening. Though, honestly, this is not something I was able to bring myself to do. Like the first season, your dialogue choices are sure have a lasting impact on different facets of the story and ending, so I’m not sure how much I want the new characters hating the girl that we spent a whole season falling in love with. It’s cool, I’ve played Trauma Center. I got this. Clementine may still be a kid, but she’s no slouch in a fight. While she may lack the brute strength that Lee had in Season 1, she makes up for it in being pretty resourceful, and this is reflected in the game’s quick-time events. 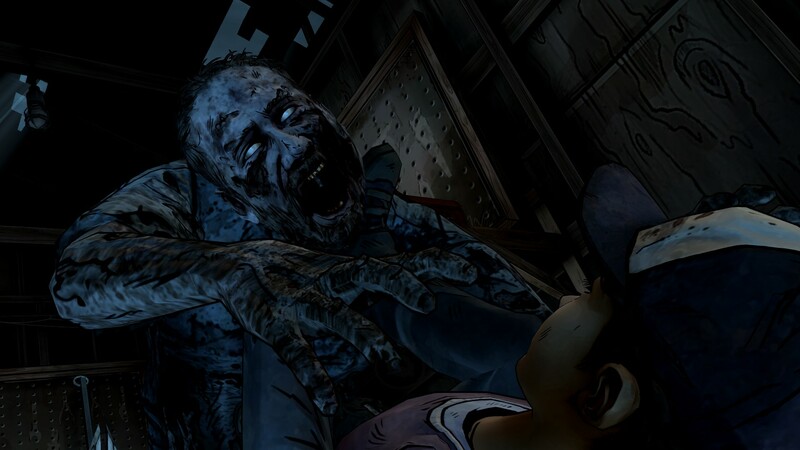 Generally unable to kill Walkers outright, Clem’s actions are more about avoiding them, with most of her QTEs involving weaving between Walkers before they can grab her. When forced into a fight, however, Clem will use any means available to survive, relying on her environment to help her out. With less emphasis on actually killing zombies, the QTEs certainly do bring a different dynamic than what Season 1 had. From Clem’s perspective, even on an individual basis, Walkers are viewed as much more of a danger than Lee would have seen. Don’t worry about the prompts too much, though – if you do happen to die, you’ll be dropped off near where you left off. When Clementine finally does get a Walker into a position to finish it off, it usually takes several hits before it’s completely down. 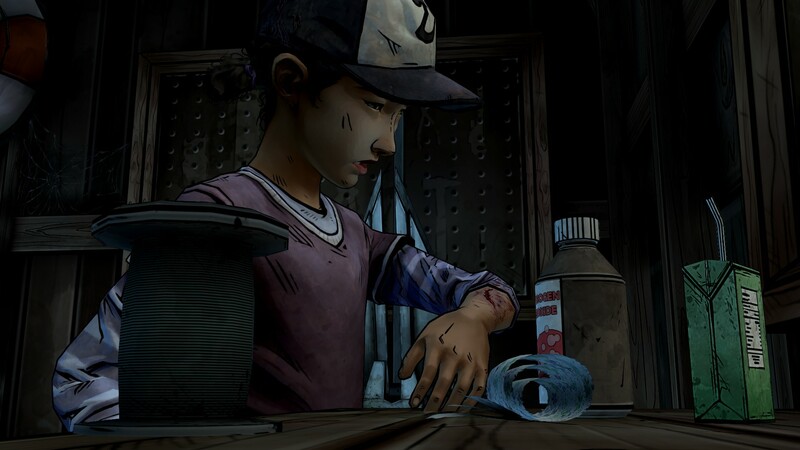 I thought these scenes were particularly tragic – it felt as though, with every strike of the hammer, a little more of Clementine’s innocence was lost. Such is the world of The Walking Dead, I suppose. Season 2 continues the cel-shaded comic book art style seen in both Season 1 and the recently released The Wolf Among Us. This really helps characters and objects stand out against the environment. Human characters are colorful and lively, while Walkers are a suitably sickly shade of gray. The voice acting, once again, is top notch. Clementine, played once again by Melissa Hutchison, really shines in this respect, which is great, considering you’re going to be hearing a lot of her. There was a particularly ghastly scene near the end of the episode where, as horrified as I was, I could not get over how amazing a job Hutchison did. I’ll leave it here for your viewing pleasure(? ), if you don’t mind being spoiled. I’ve never really felt the music in these games was that important. Sometimes the absence of music is just as effective as a soft track for a quiet moment. During combat QTEs, the music is suitably punchy and exciting, but it’s pretty standard fare for the subject matter. With a new season comes a slew of new faces, new dangers and, I’m sure, new tough decisions. Of course, the pitfall of the episodic format is that we’re forced to wait for subsequent entries, which is made all the worse when these can be completed in a couple of hours, and then they end on cliffhangers. Now is a great time to get into the second season, though, as you can get all five episodes – the first one now, and those following as they’re released – for $25. This was a strong start to the season, though I assume things are only going to get worse (for the characters, not the quality) as the story continues. I sorely hope Clem finds a safe place to call home in the end, but something tells me things are going to get worse before they get better. Note: Throughout the season, each episode will receive its own score. After the final episode, we will average the scores to find the final grade for the season as a whole. Game was purchased by the reviewer. Tyler is a lifelong gamer, getting his start on the Intellivision when he was three years old. After receiving his English degree, he discovered all those jokes about getting a job in his field were true. As Head Editor with oprainfall, Tyler is able to bridge his two passions; playing and talking about video games at any given opportunity, and being a total grammar nazi the rest of the time.